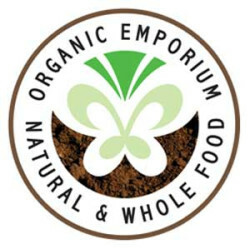 The Organic, Natural and Whole-Food Emporium is an online store that serves to bring food that promotes the health of the individual, the environment and the soil into people’s homes. You can place your order on their online store each Monday and Tuesday up until 2pm and they will home deliver to you on Friday. They bring you the freshest organic and natural fruit and vegetables from local farms with the most fertile and well-nourished soil, grass-fed and free-range ethically reared lamb, beef and chicken as well as the best artisanal whole food that you can find in Gauteng. They also do dairy and deli cheeses and yoghurt from pastured cows that eat a natural diet free of growth hormones, animal by-products, antibiotics, preservatives and colorants, free-range farm fresh eggs, whole grains, nuts, seeds, sourdough bread made with stoneground unbleached flour, natural household cleaning products, mineral make-up and much much more….simply the healthiest, natural, organic and whole food delivered to your door – visit www.organicemporium.co.za for information on how to order and to get onto their mailing list. You may also want access to Debbie Logan’s food blog and newsletter, she is one of the most exciting natural and organic food writers and will have your mouth drooling with her recipe ideas.